An x-ray confirmed indeed I have a break in the metacarpal. No wonder it hurts! It is difficult to type so I'm going to make this short. I promise to let you know who the people in "Name That Face" post are....they are some wonderful people. 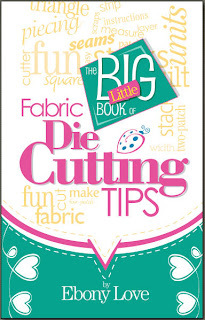 Also, I know I am to draw a name for the winner of Ebony's new book," Fabric Die Cutting Tips", today. However, I will have to postpone the drawing until tomorrow after I get my hand set so I can type easier. If not, then I guess I'll have to figure a way to video post or do a voice tape. Who knows....but with technology the way it is....I'm sure there are options. Thanks for all the well wishes. I'm sure they'll fix it right up and I'll be good as new soon. Today I'm going to let you name the face in the photo. I'm finding it painful to type because I fell on Thursday evening and hurt my right hand. The good news is, you don't have to be 100% correct to participate :) I'll put together something fun for the giveaway. Ebony Love, Love Bug Studios, is a new author and she is glowing here at Quilt Market in Houston. She seems to have endless energy and enthusiasm. "Fabric Die Cutting Tips" contains many tips and some great information for those folks who either are going to purchase a Die Cutting Machine or already own one. I have purchased and owned the Big Shot, Big Shot Pro, Vagabond*, AccuQuilt GO and the GO Baby I have first hand knowledge about all of these machines and I've reviewed them on this very blog. While reading through "Fabric Die Cutting Tips" I found some excellent tips that I think many people will appreciate. Have you wanted to cut continuous borders using a fabric cutting die? Every wonder why your was gathering or bunching on top of your die while you were putting it through your machine? Wanted to fussy cut an applique die and wasn't sure the best way to do that? Wanted to learn how to make a quick reference for yourself when using your dies? Which die works best for which block, measurements, angles of laying your fabric etc? Ebony has provided answers to all of those questions and more in her new book, "Fabric Die Cutting Tips". If you would like to win an autographed copy of " "Fabric Die Cutting Tips" please leave a comment on this post and share with all of us why you think this book would be helpful to you. I will use the random number generator to choose the winner on November 31st. *My Vagabond is the only machine that I accepted as a gift from Sizzix. I was so excited about its release I could not wait for them to be in stock at the distributors to order one. That is the truth and quite happily my excuse too....because I'd gladly pay for it 10 times over and I'm not about to part with mine, that's how much I love it. For all of you in the path of that storm....all I can say is I'll be thinking about you and I sure hope you all have a Beam N Read Hands Free Light and one for each member of your family! I have mine here with me, I'm not taking any chances! I'm sorry I did not get to publishing last evening. There were issues with our flight and we changed planes and arrived here later than expected. I got a great candid photo of Rob Krieger, the owner of Checker Distributor, yesterday at Detroit Metro Airport. I'm not sure if he dropped a stitch or was lost in the pearl one knit two sequence...but he looked a little frustrated with his needlework. In the end it looks like he got it figured out!! Our decent into Houston was beautiful. And the bathroom too!!! What a fun and wonderful surprise. Today was School House and I took over 400 photos. The camera I brought began acting up a little so Mr. McSteamy has express shipped the "good" camera and the photos tomorrow will be much better. Unfortunately I'm too tired to post about School House today....I know, I know....booo hisss....I'm sorry...really. I need to hit the hay and I'll get back tomorrow evening a bit earlier and I'll post the "goods." While I'm packing feverishly ....not only orders but my suitcase....what do you think those Flamingos are doing? appeared to be having fun and games....for Halloween perhaps? A witch and a pumpkin....what next? Oh...yes...then there was a Skeleton Flamingo! While I'm out of town who is going to be keeping their eyes on those Flamingos for me? Guess I'll have to ask around. and I did it all by myself :) Very little instruction and no thread chart....my first ME applique. The design is an Anita Goodesign bonus for those who sign up for their Clubs before the end of November. I was so tickled I could hardly believe how nice it turned out....even without any help with fabric or thread colors. I know all the Anita Goodesigns are not loaded to the website yet...what's a woman to do? Stay home from Market? Nope...not this one anyway. I'll keep working on it....but sometimes ya just have to go with the flow. Follow up post from the Vikki Pignatelli Lecture and Trunkshow. I'm back to finish my post about Vikki Pignatelli's visit to the BSQG on the 13th and 14th of October. The morning of the 14th many of us from the BSQG joined Vikki for a workshop. The morning was a lecture/ demo format to explain some of her techniques and methods. The class was offered a choice of 4 patterns to choose from. The project was small enough to finish the front in class and we were able to use what we were taught in the morning lecture. Vikki came around to help or coach anyone who requested her assistance. In the afternoon, we learned about a variety of options for borders and finishing techniques. This was is my project. I had a great time and was captivated by everything Vikki showed us. I loved the freedom I felt and the variety of options she offered. I changed some of the fabrics once I got home and began trying out some embellishments. I'm going to do some trapunto and add some more embellishments....the ones above are just laid on to preview them....I like things to incubate before deciding how to finish my projects. Jean O. also attended the class and she has finished her piece. I love Jean's work and I'm always inspired by what ever she brings to show us. Jean's quilting is absolutely beautiful isn't it? Look how it adds interest and depth to her piece. We learned about fabric manipulation in Vikki's class and Jean chose to manipulate the yellow fabric. She said once she got home all she could see was a "corn stalk." After adding some beautiful thread painting, that yellow fabric now looks like a lovely three dimensional flower. Way to go Jean!!! If you guild is looking for an amazing teacher and excellent workshop....look no further than Vikki Pignatelli. So many of the gals who attended continue to comment on what an excellent lecture and workshop Vikki provided. It was said that she is one of those teachers who doesn't hold back her knowledge...she is open and shares it all. All of Vikki's books and DVD are available from Vikki on her website, just click here if you too were intrigued and enjoyed seeing Vikki's work. 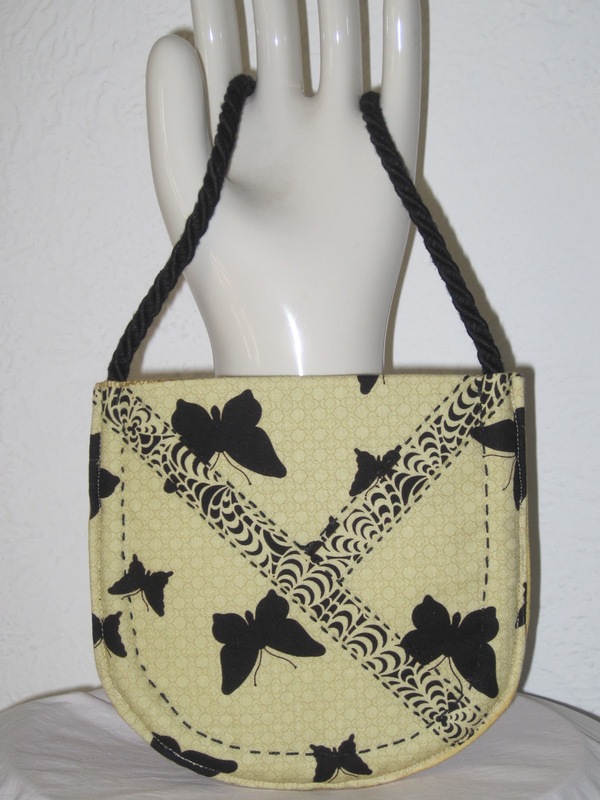 Have you seen the handbags made from Benertex Fabric Panels? 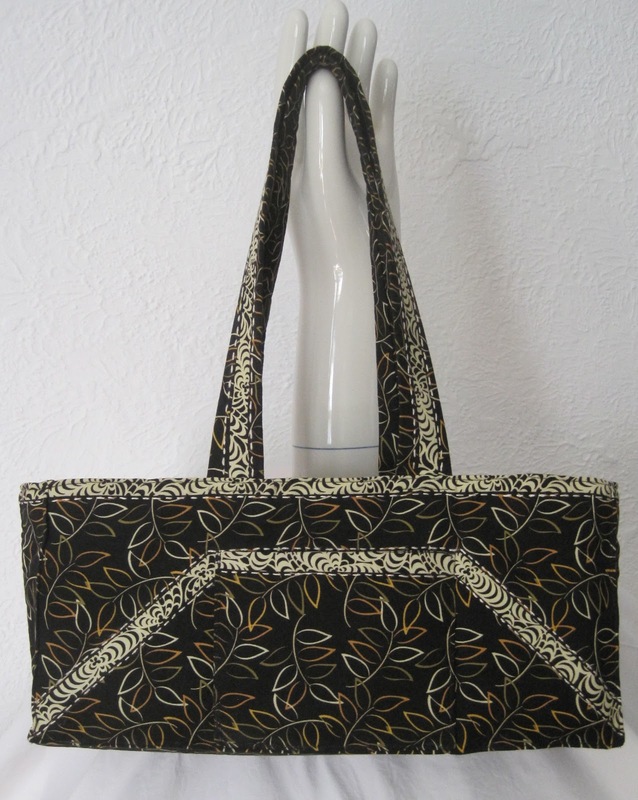 The line used is"Sonora Collection" and the handbags were designed by Ellen Highsmith Silver (She's my Floorquilts friend!). I thought the purses were neat and wanted to share them with the rest of you. Hard to believe this lovely bag was made from a panel isn't it? If you want to see the kits, you can purchase them over at Keepsake Quilting. I really like the last one and wish I had already made one to take to Quilt Market with me next week in Houston. No time....what's new? Before IHAN® I didn't know any of the wonderful artists and designers that I now know. I loved Ellen's book "Floorquilts" and I am always happy to see her latest projects. Going to Quilt Market allows me to see these things up close and personal and catch up on who is doing what. 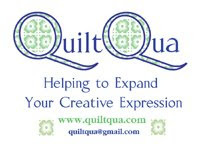 Stay tuned for Quilt Market News later in the week. Last Wednesday, I posted about the Seam Fix Un-sewing Tool. I found it very helpful and offered to give one away and announce it this past Monday. Guess what? I never did that. Oops....sorry about that. Between launching the IHAN ® Creative Group and Vikki Pignatelli's lecture and workshop, I've been very per-occupied. Congratulations goes to The Slow Quilter!!! Please e-mail me with your full name and address and the color Seam Fix you would like to receive. Thank you to everyone who left a comment and stops by regularly to visit too. Vikki Pignatelli came to the Black Swamp Quilt Guild this past Friday and I'm telling you it was fabulous. The lecture and the trunk-show provided a very inspiring. evening. “Nurturing Your Creative Spirit: Personal Traits That Inspire Great Quilts” was the title of Vikki's lecture and it was based on her new book "Nurture Your Creative Spirit-Wisdom and Insight Learned Through the Art of Quilting." Vikki has self-published her amazing book and if you would like a copy or to read more about it you can CLICK HERE. After Vikki's lecture, she shared her first quilt with us. She begrudgingly agreeing to attend a beginners quilt class in 1991 with her sister. Vikki didn't have a background in sewing and wasn't given all the "rules of the quilt police." Since that class, she has taken a first place award in Art Large for Portrait of my Soul at the International Quilt Festival at Houston and Best Color and Design for Passages of the Spirit in the 2002 NQA annual show. This one took my breath away. Vikki said that other than the spirits, the rest was all put together improvisationally. After I took her workshop, I could understand better how that all came together. Before I had learned about her techniques for quilting curves, I would have found it almost impossible to think I could approximate anything of such interest improvisationally. I wish all of you could have been sitting with us that evening and listening to Vikki talk about how she was inspired to make "Passages of the Spirit". Many of us marveled over this quilt. From a distance is is amazing and captivating. It's beauty goes deeper and deeper the closer you get to the quilt. I can't even remember how many layers of sheer polyester Vikki said she layered to create the colors of the sky. Look closely at the same piece, "Against All Odds". Vikki has felted a variety of textiles including silk, silk roving, wool, cheese cloth, sheer polyester, cotton.....(don't quote me because I'm going from memory here) to create the texture and depth in the details of her tree. The richness just gives me tingles. I think that is all I will share today. I'll share more of her work and about the workshop. Between Waldo and I we bought all 3 books and Vikki's DVD. We didn't want to miss a thing! Guess Who I Saw At the American Sewing Expo?